The In-Sight 9000 is a rugged, ultra-high-resolution line of standalone vision systems. With its ability to acquire and process exceptionally detailed images, the In-Sight 9000 delivers high accuracy part location, measurement, and inspection over a large area—even when mounted at longer distances. Line scan and area scan image acquisition options are available for imaging continuously moving or stationary objects. Plus, a full suite of vision tools configurable through the In-Sight EasyBuilder interface solves a wide range of applications across industries. The In-Sight 9000 captures a large field of view which allows users to inspect sizable objects while maintaining exceptional image resolution. This also enables customers to mount the vision system away from conveyors and maintain a safe distance from hazardous equipment. The In-Sight 9000 eliminates the need to install multiple cameras in applications with large objects or parts. As a single camera solution, the In-Sight 9000 reduces complexity, calibration requirements, and cost compared to multi-camera systems. The self-contained unit reduces the amount of equipment to be installed on space-restricted production lines. Plus, IP67-rated housing protects the system from liquids and dust without the need for an external enclosure. 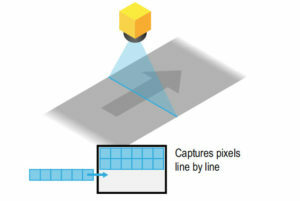 The In-Sight 9000 offers both line scan and area scan image acquisition methods. The In-Sight 9902L line scan vision system is designed to inspect large, cylindrical, and continuously moving objects. It captures 2,000 pixels with each line, delivering 32MP images (16,000 lines) that enable vision tools to perform highly detailed inspections. Each pixel line is acquired at 67,000 lines per second (15us scan rate) to keep up with the fastest production lines. Available in monochrome and color models, the In-Sight 9912 area scan vision system is ideal for inspecting large, stationary parts. Acquiring 12MP (4096 x 3000 pixel) images, the 9912 captures detailed images for high accuracy measurements and inspections without sacrificing field of view.The In-Sight 9912 eliminates the need to install multiple cameras in applications with large objects or parts. As a single camera solution, the In-Sight 9000 reduces complexity, calibration requirements, and cost compared to multi-camera systems. The In-Sight 9902L 2K line scan smart camera is a high resolution self-contained vision system ideal for detailed inspections of large, cylindrical, or continuously moving objects. The 9902L acquires up to 16,000 lines of 2,000 pixels per line to produce a 32MP image that can used to detect even the smallest features and defects. Each pixel line is acquired at 67,000 lines per second to keep up with the fastest production lines. This standalone vision system only requires a small view of the target part, making it an ideal choice for installations with restrictive field of view or mounting space requirements. 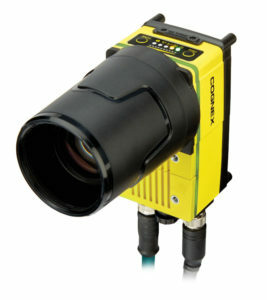 The In-Sight 9902L is the only embedded industrial line scan system that processes images directly on the camera. 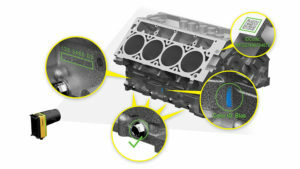 Onboard processing eliminates the inconvenience of having to install a separate controller. Plus, the IP67-rated housing protects the system from liquids and dust without the need for an external enclosure.